ARTh by Kshama hosted its first independent painting workshop a year back on Women’s Day. The journey ever since has been overwhelming. This workshop is dedicated to all the wonderful women who has been pivotal for ARTh be it family, friends, my team or the amazing participants. So ditch your routine and buckle up as we celebrate Women’s Day whilst painting this gorgeous piece of art made more interesting with the palette knife. A step by step guided art workshop. Participants with no prior experience will also find themselves paint with ease and take home their lovely painting. 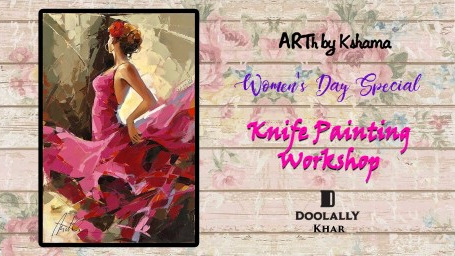 Share "“Women’s Day Special” Knife Painting Workshop - ARTh by Kshama"